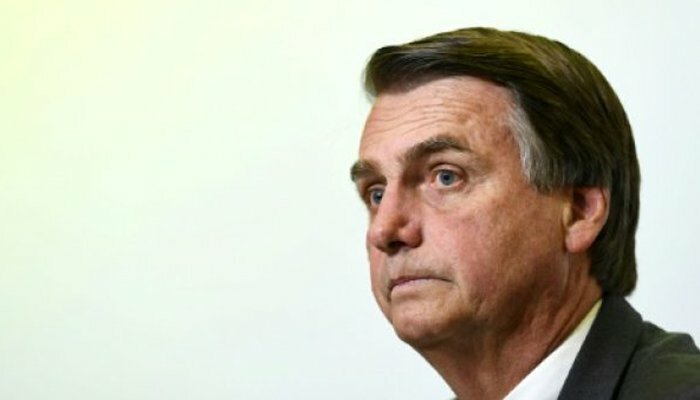 BRASILIA (Web Desk) Right-wing presidential frontrunner Jair Bolsonaro was attacked with a knife while campaigning in Brazil on Thursday but escaped with just minor injuries, his son said.Images shared on social media and television showed Bolsonaro being carried on the shoulders of a throng of supporters before a man lunges at his stomach.Thank God it was barely superficial and he’s fine,” Flavio Bolsonaro wrote on Twitter about the incident in Minas Gerais state, in the country’s southeast. The apparent attacker is then grabbed by several Bolsonaro supporters before the video cuts out.Other images show the presidential candidate being carried to safety.Bolsonaro, a 63-year-old former army captain, was taken to a nearby hospital in the town of Juiz de Fora, police said.With jailed former president Luiz Inacio Lula da Silva ruled out of the October 7 election, the latest polls from the Ibope Institute put Bolsonaro in a clear lead with 22 percent compared to 12 percent. Each for environmentalist Marina Silva and center-left runner Ciro Gomes.One of his campaign pledges has been to legalize the carrying of weapons in order to combat rising violent crime.Despite being a long-serving member of Congress, he has successfully presented himself as an outsider, untouched by the corruption scandals engulfing so much of the political elite.Yet he’s also courted controversy with comments about homosexuals, women and victims under the 1964-85 military dictatorship.